While we were staying at the resort, Crystal Paradise in Belize last year, Steve and I were in the outdoor dining area chatting with some of the other birders staying at the resort when all of a sudden we heard screeching nearby. The kind of screeching that would make your ears bleed. When birders hear sounds like that everyone grabs their binoculars and/or cameras and walks–no, RUNS–toward the mayhem. The screeching came from a pair of White-fronted Parrots that were fighting a female Pale-billed Woodpecker over a nest. 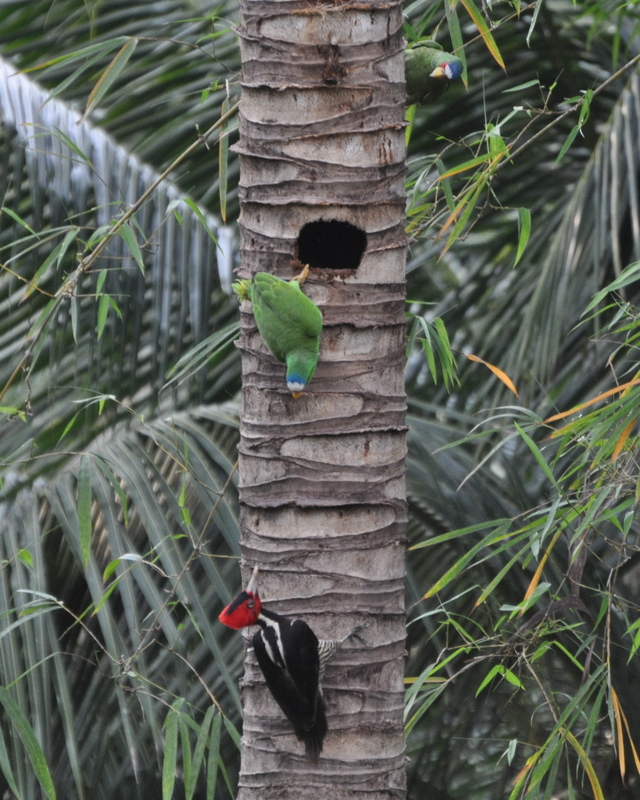 Clearly, the woodpecker excavated this nest hole, but the parrots wanted it. I suppose the rule of possession is nine-tenths of the law also applies in Belize. And even for birds. Stand off at Crystal Paradise. ← Okay, call me lazy. But I prefer canoeing over walking.